for FIRST 20 PAID PARTICIPANTS!!! SLAMMED is GTD's original favorite. This is the Adventure Trip that started it all! SLAMMED is the first trip (and only trip) offered by GTD in 1996 and God used it to give birth to the full time year-round ministry that we are today (ALL glory to God!). Over the course of 5 days GTD slams you with several heart-pounding adrenaline-pumping adventures that will exhilarate you to the core! In our time together we will travel to the amazing & beautiful Pisgah National Forest in North Carolina to go camping, rock climbing, rappelling, waterfall sliding, cliff jumping, whitewater rafting, & so much more. Now you see why we call it SLAMMED! We will chase after all of these adventures as we explore the majesty of God's creation. And that's not even the best part, we will also explore the majesty of God's presence through daily devotions, praise & worship, and nightly impact points around the camp fire. SLAMMED will challenge you and potentially change your life as you grow closer to God, make new friends, encounter & overcome fears, and engage in some of the most outrageous adventures of your life! Instead of getting so busy that you feel crammed, take 5 days to jump start your life by getting SLAMMED! Check out this SLAMMED promo video! TENTS: Large Coleman 14´x12´ Evanston tents with hinge door system. MEET-UP SPOTS: There are 3 different meet-up locations to choose from. Please be early or right on time!! Meet in the rear lot of Smiley's (see map). We cannot guarantee vehicle safety. You may want to arrange to be dropped off. From I-75 take Exit 279 (SR54) East for 1/2 mile. 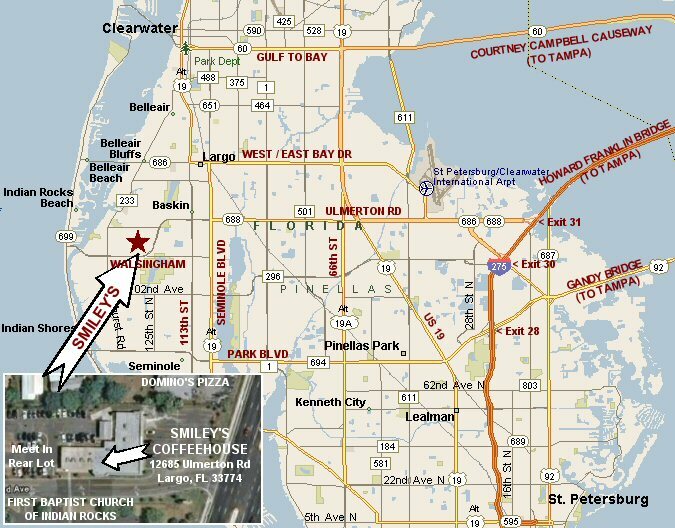 Publix is on Right. 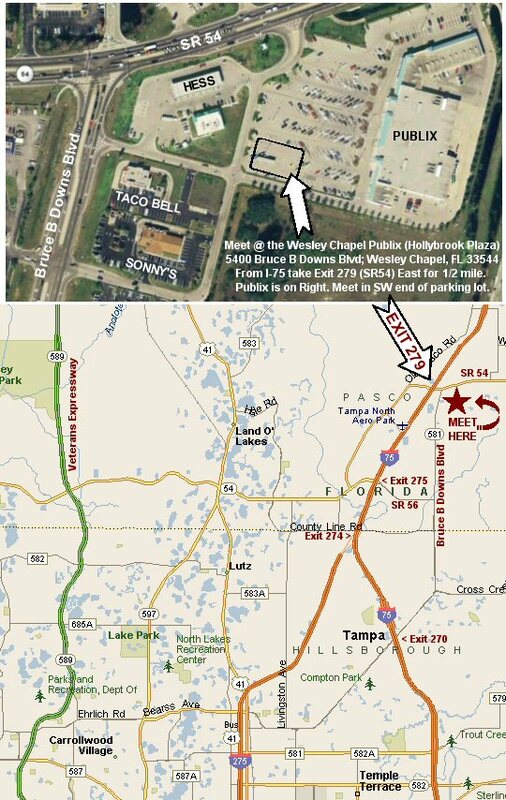 Meet in the southwest end of the Publix parking lot (see map). We do not recommend leaving your vehicle here. Arrange to be dropped off. **There is a creek crossing approx 20 feet wide. GTD CAN NOT GUARANTEE VEHICLE SAFETY AT ANY LOCATION! Our goal is to return back to Wesley Chapel around 8.30pm & Largo around 9.30pm. These are goals. Many factors can affect the return time. It's important to maintain a flexible attitude throughout the journey. TOP ROPE ROCK CLIMBING & RAPPELLING: Top-roping is the safest form of climbing. It offers the rock climbing experience with all the rewards but minimal risks by allowing you to climb a rock face with the safety rope always anchored above you minimizing your falling distance to only inches or a few feet. WATERFALL SLIDE & CLIFF JUMP: This may be the most exciting adventure of the trip as we hike in 3 miles to Turtleback Falls! You'll love it as you slide 15' over a smooth turtle shell shaped rock into a pool of water below. 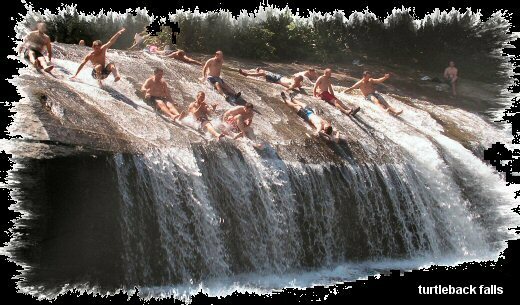 Then it's on to a 25' cliff jump into the deep water beside the majestic 200' Rainbow Falls! And the 6 mile round-trip hike is a workout! WHITEWATER RAFTING: The French Broad River is a modest river made up of many class 2-3 rapids. It flows thru the heart of Pisgah National Forest. There are wide open channels, beautiful mountain vistas, & fun splashy rapids. Our 5 mile half-day trip includes lunch & extra time to play as we leap into the river at Jump Rock and swim at Swimmers Rapid!! POSSIBLE NIGHT SLIDE AT SLIDING ROCK: This 60-foot flat natural waterslide is fueled by 11,000 gallons of water flowing down the rock each minute, creating a one-of-a-kind thrill. Sliders line up to ride the water down the sloping boulder into an 8' deep pool then swim a few strokes, get out, and do it all over again. We may do a "night slide" if we have time. We don't supply many snacks so bring them if you need them. If you are a vegetarian or have special dietary needs we will try to accommodate, but we need to know in advance (you may want to bring a few supplemental meals). Full time guides, transportation from Tampa Bay area (& back) for first 20 paid participants, fuel (ouch! ), whitewater rafting, rock climbing, possible rappelling, hiking, God-awesome swimming holes & waterfall slide, additional campsite activities, all activity equipment & gear, accommodations, up to 11 meals, devotions & spiritual emphasis, a lifelong memory! Individual sleeping bags, water bottles, snacks, meals during transit, items listed on checklist (see below).